As you're saving for your retirement and planning for the future, inflation plays an important role. It's a natural and necessary part of our economy, but if you're not careful, it can slowly eat away at your nest egg. If you spent $100,000 in 2000, you'd have to spend $138,665 now to get the same value. To put it another way, if you put $100,000 under your mattress in 2000 and sat on it for 16 years, you'd have lost about $38,665 to inflation. That's a substantial amount! Inflation can also be affected by monetary policy, macroeconomic trends, and government investment (or lack thereof) in certain areas of the economy. We can debate whether the government's influence over inflation and other areas of the economy is good or bad, but one unavoidable fact is that inflation is caused by economic growth. This means even in a healthy, productive economy, a small amount of inflation is normal and expected. Remember the $100,000 that you hid under your mattress? It's important to have some cash to fall back on in hard times, but if you're saving for retirement, cash is usually not a great way to do it in the long term. Investment advice is beyond the scope of this article, but the bottom line is that you should seek returns that are larger than inflation. When someone advertises an investment to you ("3% return! "), you need to be careful. Find find out whether that is before inflation (ie., "nominal return") or after inflation ("real return"). Usually all returns are advertised without including inflation. Unless you check, that 3% return sounds great but actually just means you'll roughly break even thanks to year-over-year inflation. A good rule of thumb is that for any pre-inflation return, subtract 3%. U.S. inflation is low in 2016 (see the calculation here) but since 1980, inflation has been exactly 3%, and since 2000 it has been 2.08%. It can't hurt to leave a little wiggle room. If you're reading this article, you're already a few steps ahead. It's easy to account for inflation when making future plans. The key is just remembering to factor it in. 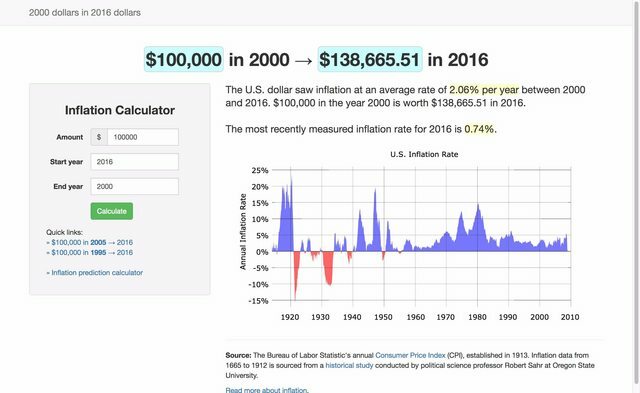 You can use our inflation calculator to make checking and predicting future inflation very easy. We hope this tool helps you as much as it helps us!